10" X 7.5" X 5"
Buddha fasting, Buddha in 'bhumisparsha-mudra', Buddha's 'dharmachakra-pravartana', teaching Buddha, Buddha's 'Nirvana' and thousand Buddha have exceptional significance in Buddhist classical iconography. These forms of his iconography are not mere artistic innovations of his life theme but depict the turning points and some of the cardinal events of his life. The earth touching posture or his 'bhumisparsha-mudra' constitutes the exact central point to the episode of Buddha's attainment of enlightenment. It depicts the phase when seated under the Pipal tree he was engaged in his penance and was almost on the verge of attaining Enlightenment. As always, it alarmed the forces of Evil, which fed on darkness or ignorance and delighted in obstructing the process of enlightening. Hence, Evil, personified as Mara and armed with horror, fear, temptation, 'Kama' and beauty, attacked Buddha and tried on him all its weapons. When nothing worked Mara created confusion all around. There rose voices that said, 'Gautam, you are vanished'. Mara aimed at confusing him but set deep within him and unaffected by whatever happened beyond, Buddha quietly lowered his right arm and extended its middle finger to reach the Earth. He touched the Mother Earth and invoked her to witness that whatever came his way, he did not astray from his path. He thus defeated Evil and a little after there emerged divine light and Gautam was the Enlightened, the Buddha. 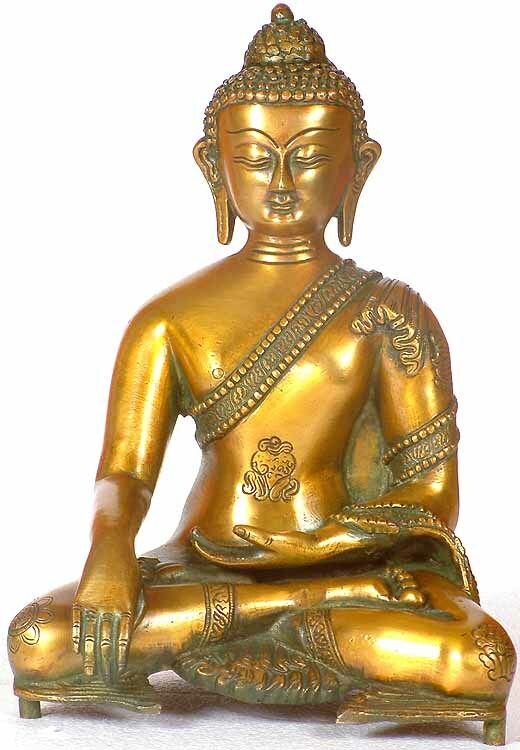 This 'Padmasana' image of Buddha is in meditative posture, which is its prime theme and the basic character of the moment which it depicts. Mara's attack and other related activity are only a passing phase. Hence, but for his right hand lowered to touch the mother Earth, his entire form manifests him in his meditative demeanour, which his left hand so absolutely symbolises. Broad forehead, sharp nose, cute small lips, pointed chin and semi-opened lotus like eyes define the aesthetic beauty of his face. His shoulders are sturdy. The left half of his torso is covered by fine sash marked over the eight auspicious symbols of Buddhism. This sculpture was cast in the central Indian city of Aligarh.